MY OPINION: 6.1 || A story of resistance to institutionalized cruelty that’s engaging but also very familiar. We’ve seen this storyline before, from Cool Hand Luke to Papillon to every film that’s ever been set in a British boarding school. Nonetheless, despite a fairly predictable adherence to convention, it’s an emotionally absorbing story with good cinematography and a strong sense of place. SYNOPSIS (Courtesy of IMDb): Norwegian winter, early 20th century. On the boys home Bastoy, a new inmate leads the boys to a violent uprising against a brutal regime. How far is he willing to go to attain freedom? Strengths: It’s a nice looking film with a consistent blue palette to match the frigid environment. There’s a nice opening that establishes a recurring theme, and the filmmakers make us feel for the plight of the boys (many very young) who’ve been banished to Bastoy. There are good insights into the pressure to conform and to look away from evil as a matter of self-preservation. Weaknesses: It may be a little unfair to critique the film for its familiarity, but there’s a certain by-the-numbers feeling that settles in when you’re visiting such well-traveled dramatic terrain. We know that the rebel we meet at the beginning will resist the regimentation, that there will be attempts at escape, that the rebel will eventually win allies among his initially downtrodden peers, that the weakest boy will suffer, and that there will be many scenes of sanctimonious cruelty. Although those elements are all well-presented, their predictability detracts from their power. Characters/Performances: Stellan Skarsgård’s headmaster has elements of complexity and hints of pathos but winds up being a fairly standard-issue hypocrite. In a better film, his failure to do the right thing for his charges would feel like tragedy; here it’s just hateful. Kristoffer Joner is realistic as the movie’s one complete villain – hateful but not overdrawn. And the boys all give convincing performances (even if they are, through no fault of their own, a little hard to tell apart at the beginning). 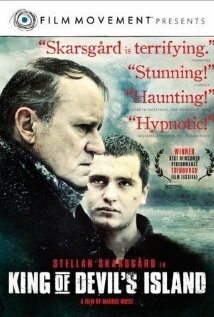 Best Scene: When Skarsgård makes his decisive turn toward cowardice, subjecting the blameless boy Olav (Trond Nilssen) to a humiliating rebuke, it’s a chilling moment of moral abandonment. You can earn some additional money from your website, i see several opportunities here.